“Do you have plans tonight? Wanna come over, make me dinner, and watch a movie?”. That was my text to my old friend Sheridan one Sunday night at the end of last year. My husband was away and all the end of year ‘lasts’ – functions/events/things, had left me exhausted. And although normally under such circumstances, breakfast cereal is the dinner time option of choice around here, I couldn’t face another such dinner for the 5th time that week. Generous and hospitable as she is, even at my place rather than hers, Sheri came over and made this delightfully easy and tasty Donna Hay dish, which just happens to be gluten, egg, wheat and dairy free. Her food, good company and contentment with not much chit-chat that night were real blessings to me. And we’re still laughing about how from now on she’s going to have to read my sms invitations carefully to check who’s doing the cooking! 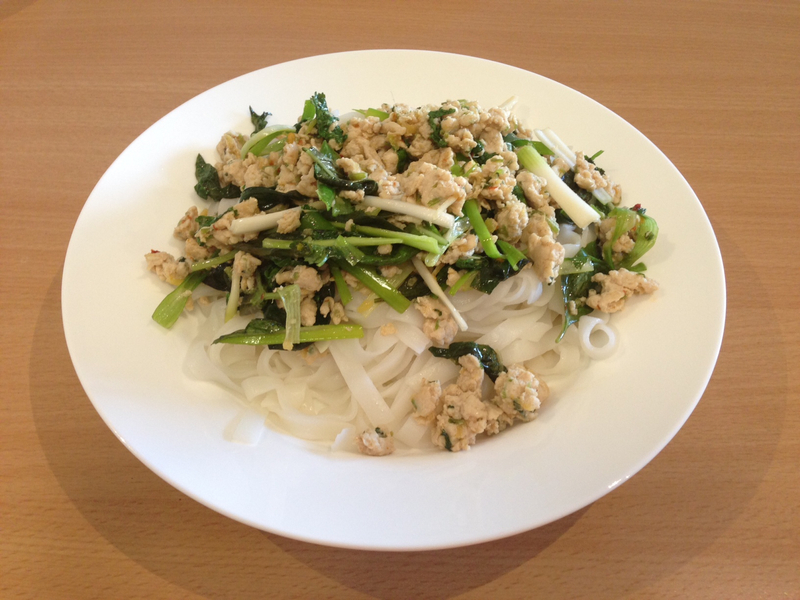 Super simple to make, fresh and healthy too, this noodle dish is perfect for cooking for yourself or friends straight after work and can easily be multiplied for a larger group. And all of the preparation can be done quickly and hours ahead of people coming over – once they’ve turned up and have a cold drink in their hand, just stir fry everything from start to finish in 10 minutes. If you purchase your herbs from a grocer rather than a supermarket, this dish costs no more than $10 to make and serves 4. Thanks for this terrific recipe, Sheri. Put a large pot of water on the stove and bring the boil for cooking egg noodles. Heat a frying pan or wok at high heat. Add the oil, ginger, coriander stalks, lemongrass and chilli and cook for 1 minutes. Add the chicken mince and cook, stirring for 6-7 minutes or until cooked through, breaking up any large lumps of chicken as you go. Add rice noodles to the boiling water and cook according to instructions on the packet and when soft, drain in a colander. Stir through the lime juice, fish sauce, sugar, coriander, basil and green onions. Serve stir-fry in bowls on top of freshly cooked rice noodles. Super yum, and I had most things in my garden! Thanks for this one.